The Lizard's Tale is an international thriller written by Kurt Kamm. Alejandro Luna had a plan that would leave him and his wife financially secure for the rest of their lives -- with a little extra for some of the things he had always dreamed of having. When he left their home early one Monday morning, he told his wife that he would be attending a meeting of the Rainforest Alliance and the coffee farmers, where options for sustainable farming would be discussed. He had other plans, however, that he would never discuss with her. Alejandro was meeting with Jose Miguel in Estanzuela in the Motagua River Valley, some hours away from their home in Guatemala City. Jose Miguel was anxious and worried that at any moment the police might ask to see what he had inside his truck, but he still demanded that Alejandro increase the payment promised for his find. He had no idea of the true value of the large, black lizard he had captured, but Jose Miguel did wonder about the superstitious regard in which that incredibly rare and endangered creature was held. While he breathed a sigh of relief after handing over the Motagua Valley beaded lizard to Alejandro, Alejandro juggled plotting his trip into Mexico with thoughts of how he'd spend the American dollars that would soon be his. 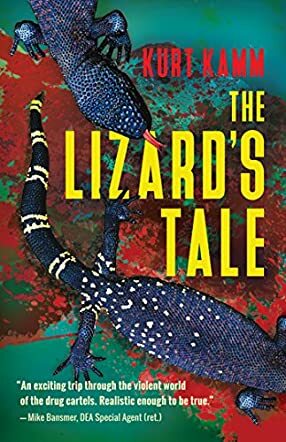 Kurt Kamm's international thriller, The Lizard's Tale, is a tense and fascinating read that looks at Mexican crime cartels, the US war on drugs, and the black market trade in endangered and rare animal species. It does that in a most compelling tale about the Motagua Valley beaded lizard, a highly rare and poisonous lizard found only in Guatemala. The Lizard's Tale had me hooked from the first paragraph as I followed Alejandro's route through Guatemala via a Google map, and, later on, I kept a map of Catalina Island open to trace the lizard's travels. I especially appreciated the format of this story and loved learning about this little known relative of the Gila Monster and the environment in which it lives. This action-packed thriller shows the reader the inner workings of the DEA in their dealings with international drug trafficking, as well as giving some insights into the little known drone programs, including how they're used both for war and surveillance and the stresses and strains that are experienced by the drone operators. Kamm's characters are well-developed and authentic, and their personal stories enhance this exciting and finely plotted tale. The Lizard's Tale is literate, exciting, and very entertaining. It's most highly recommended.